Mouser and Imahara Unveil Giant Spider-Bot as Basis for Second Robotics "Empowering Innovation Challenge"
Mouser Electronics and Grant Imahara are calling on engineers to submit creative ideas for Grant's giant Spider-Bot. This newest Challenge is part of the exciting Empowering Innovation Together program where engineers can join in the technical discussions to explore new design ideas and solutions. 03/25/15, 03:52 PM | Industrial Robotics, Unmanned & Other Topics | china | SCHUNK Inc. Since 2003, SCHUNK has been represented in China with its own subsidiary, and has grown consistently since that time. 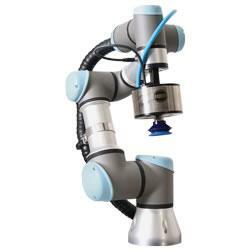 Without any expert or experience of robot, you can finish your projects by your own. Just go visit www.cgsautomation.net and choose what you need items. You will be finsihed your project in a short time. 03/25/15, 09:37 AM | Industrial Robotics, Factory Automation | Industrial Robotics | CGS Automation Inc.
Professional providing robotic & automation EOAT modules and components for any industry adopting. Especially for EOAT modules, Cups, Cup with adapters, Mounting Clamps, Gripper Mounting Arms, Suspensions, Sprue Grippers, Gate Cutters, Air fittings and etc. It can get from website by credit card/ debit card and shipped to US any state in a short time. February was another big month for investments in robotic startup companies. 3D Robotics, Flyability, Fetch Robotics, EHang and many others. odos imaging cordially invites you to visit us at booth 998A at Automate 2015 in McCormick Place, Chicago from 23rd-26th March. Yaskawa started in 1915 as a producer of coal mining equipment by Daigoro Yasukawa, known today as the founder. Is A Sperm Robot Coming To You? Single-cell management has traditionally been accomplished with pipettes, optical tweezers, or specialized small volume designs. Now, other bio-inspired methods rely on controlling applied magnetic forces, such as the wireless control of microrobots.